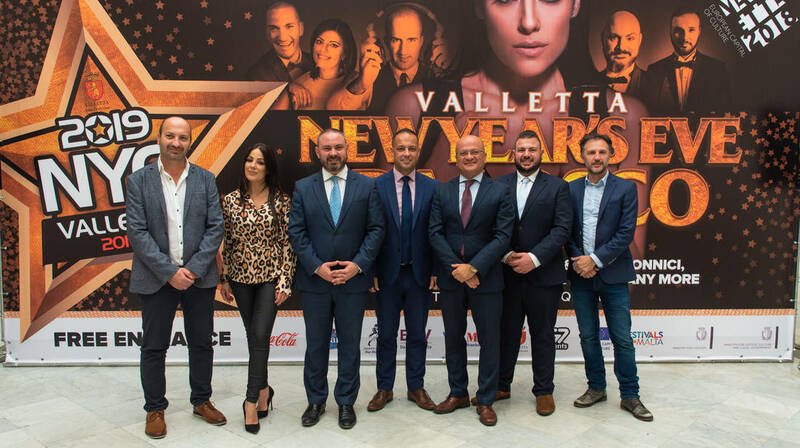 Following a successful year of Valletta as the European Capital of Culture, with over 350 events held in Malta and Gozo as well as the participation of about 2,000 artists and the attendance of around 350,000 people, it is now time for the national New Year’s Eve Celebrations in Valletta. Minister for Justice, Culture and Local Government Owen Bonnici commended these celebrations and stated that New Year’s Eve festivities in our capital city have become an inherent part of our cultural calendar for which the public attends with great enthusiasm. “It is a great honour to have such a large scale event which attracts both local and foreign people whilst showcasing local talent. This was a milestone year for culture and its legacy in our country and through these celebrations, we will continue to give Valletta a European dimension together with other European cities and towns which will also be welcoming the New Year in this manner”, said Minister Bonnici. St George’s Square will once again host the main stage and will see the very best of Malta’s local artists. The night will kickstart with local band Xarulù, followed by one of Malta’s biggest artists, Ira Losco. Ira Losco will be accompanied by her band and will be performing the very best songs from her repertoire which include her chart-topping singles, What I’d Give, Me Luv U Long Time, and her recent single One In A Million, which is also included in her 7th album titled No Sinner No Saint. Corazon Mizzi and Owen Bonnici will be hosting the event. Parliamentary Secretary for Consumer Protection and Valletta 2018 said that, “Valletta’s reign as the European Capital City of Culture will be coming to an end this December, however we will continue to celebrate our culture and traditions in the years to come. During the nationwide festivities for the coming season, Valletta will be ablaze with all that makes New Year a special occasion not only for us locals but the hundreds that visit us purposely. I am pleased that the activities for the New Year will also herald the legacy for Valletta 2018”. Valletta 2018 Foundation Chairman Jason Micallef said that, “this is a special year for Valletta, and it is therefore fitting that we end it with a celebration which is equally special. After successfully executing a cultural programme with almost 400 events this year, this event will be one of the last in Valletta 2018’s calendar, which, like the rest, will surely remain etched in the European Capital of Culture’s Legacy. Once again, St George’s Square will host a huge celebration which will attract thousands of Maltese families and tourists to Valletta to celebrate the New Year as one large community”. Following Ira Losco’s concert, DJ Pierre Cordina will take to the stage for an energetic countdown. He will be playing a mashup of the best dance anthems of 2018. DJ Mykill will close off this magical night accompanied by live trumpet. Firework displays and special effects will also be part of the festivities, creating a magical and colourful atmosphere. The Valletta New Year’s Eve Celebrations are being organised by the Valletta 2018 Foundation in collaboration with G7 Events, the Valletta Local Council, the Malta Tourism Authority, the Ministry for Tourism, and the Ministry for Justice, Culture and Local Government.